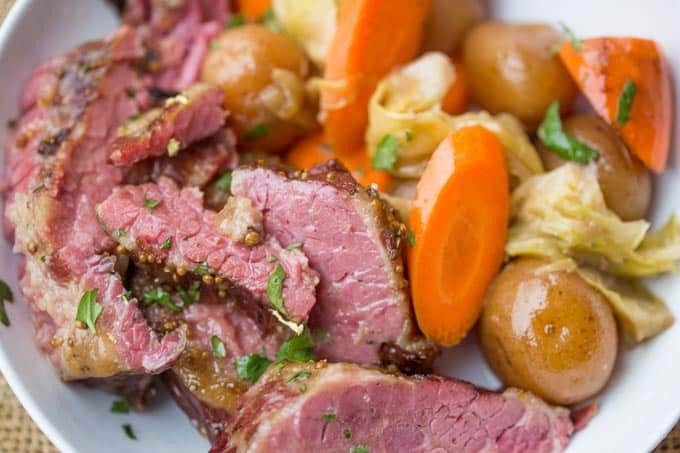 Slow Cooker Corned Beef Dinner all made in one pot with cabbage, potatoes and carrots for the perfect easy St. Patrick’s Day dinner you can just set and forget. Slow Cooker Corned Beef Dinner will make your dinner a breeze since all the vegetables cook right along with your corned beef. 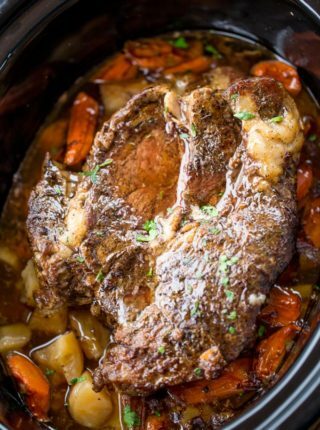 The method used in this Slow Cooker Corned Beef Dinner is the same as my Crispy Slow Cooker Corned Beef except I use a bit of liquids to cook down the vegetables in this making it a true one pot meal. 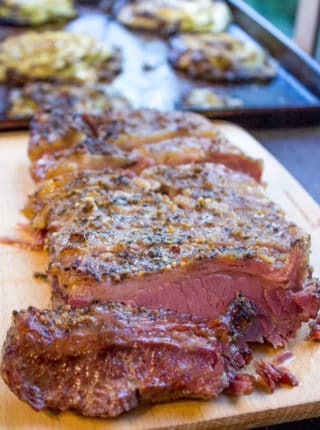 If you want to make the Crispy Slow Cooker Corned Beef, you can make Crispy Roasted Cabbage Steaks on the side with and Crispy Roasted Potatoes for an option. 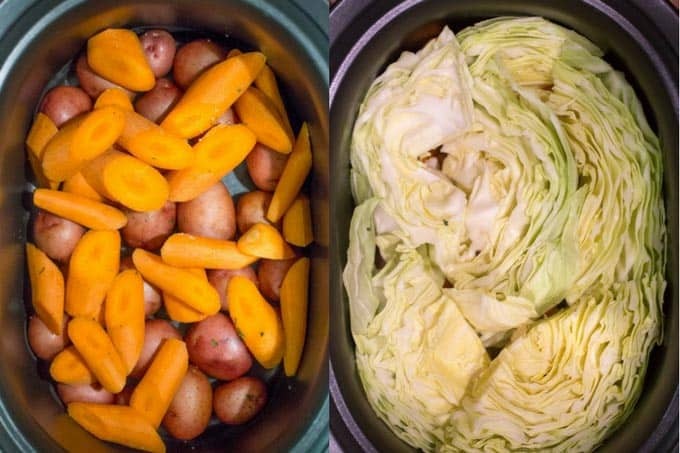 I make this a bit differently than most people do, keeping the corned beef outside of the liquid and layering the vegetables so the potatoes don’t brown and the cabbage makes a nice even layer to let the carrots rest and stay out of the liquid. 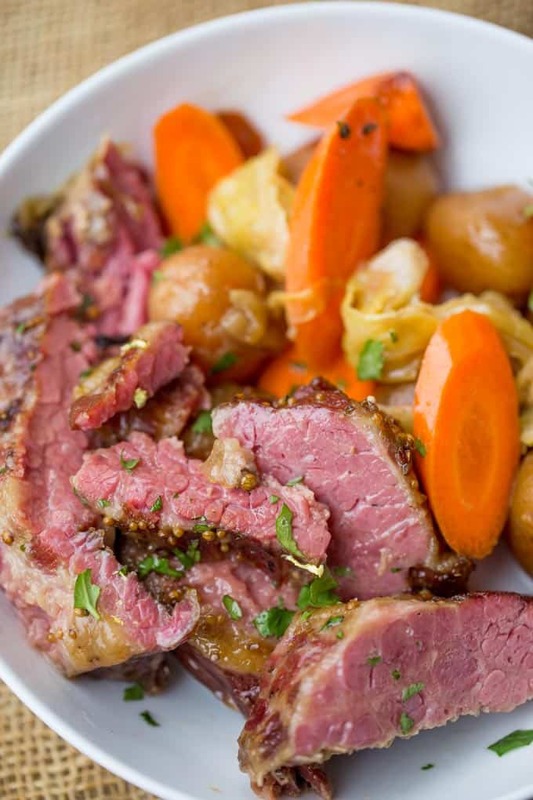 Slow Cooker Corned Beef Dinner all made in one pot with cabbage, potatoes and carrots for the perfect easy St. Patrick's Day dinner you can just set and forget. Place potatoes cut side down, add the carrots and layer the cabbage in an even layer on top. Add the water, minced garlic, bay leaf, sugar, apple cider vinegar and black pepper to the top of the vegetables. Cook on low for 8-9 hours. Remove bay leaf before serving. 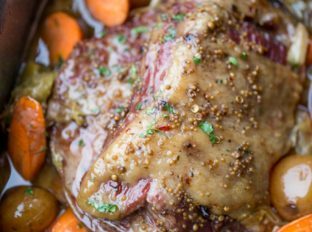 67 year old man here, trying to learn to cook EDIBLE food, so I have a quick question here about the cabbage, I plan on doing this for St. Patrick’s day. Other recipes tell you to add the cabbage the last hour or two, but your recipe puts it in right from the start, and in the pictures, I see very little cabbage on the finished product. Does the cabbage turn mushy, disintegrate, or does it still have some texture to it ??? So sorry I am just now seeing this! If you’re worried about the texture, you can definitely put it in later on in the cooking process. I hope you enjoyed it! Hi Sabrina, I noticed in this recipe you used a 4 lb corned beef and in the crispy corned beef you used a 3 lb. 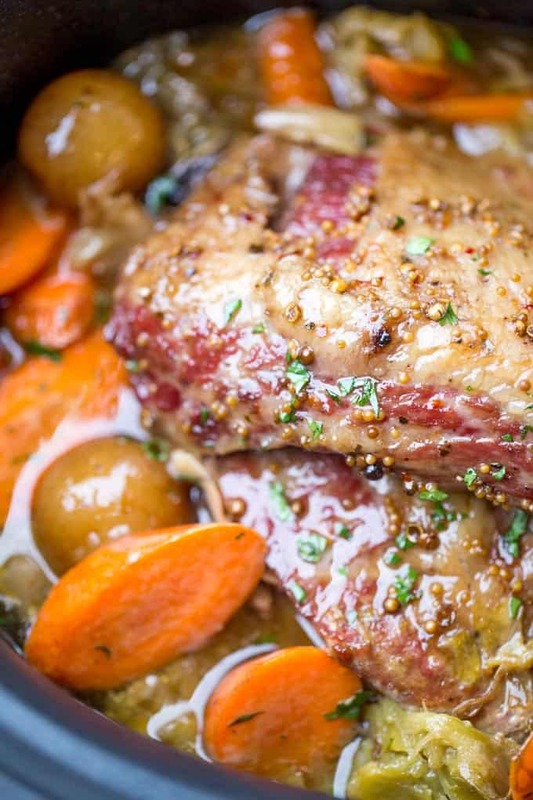 Do you think it is all right to use a 3 lb roast in this recipe and keep the time the same? Looks delicious! and I can’t wait to try it for company tomorrow. 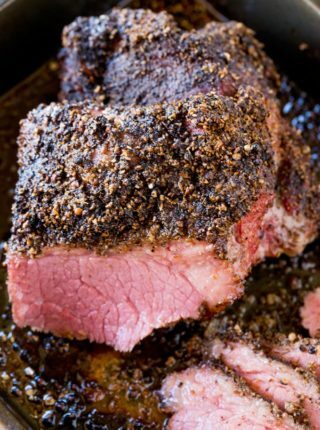 This recipe looks lovely, could you please tell me what spices to rub on the corned beef? I’m in Australia so I don’t know what a spice packet is. You might be able to find a prepared mixed pickling spice at the grocery store otherwise the packet usually consists of some mustard seed, coriander seed, bay leaf, and maybe some hot pepper. Hope this helps! Thanks so much Debbie! I’m so glad you enjoyed it! I found your recipe on pinterest and made my corned beef dinner yesterday following it and it was perfect. One pot, yeah!!! The veggies were perfectly cooked and the meat was delicious. Thank you for sharing. Awesome! So glad you enjoyed it!! I’m honestly not a very big fan of cabbage, but this recipe had so much flavor I enioyed every bit of it! Thank you! This will be my traditional St Paddy’s Day dinner! You’re so welcome! I’m happy to be a part of your holiday tradition! Plan to make this dinner tomorrow but I was thinking of adding the carrots and potatoes about 4 hours into the process for fear they would get overdone. From the comments, it sounds like that isn’t necessary. Your thoughts? Yep, not necessary. 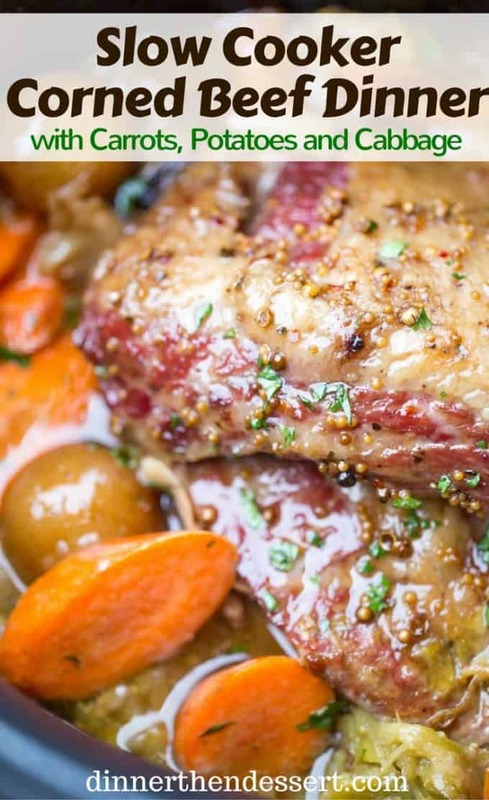 This is truly a one pot dish which makes it easy to set it and let the slow cooker work it’s magic 🙂 Make sure to layer as recommended. Hey Sabrina, can’t wait to try this recipe! Can I substitute the water for Guinness beer? If I do should I adjust the other seasonings? Hey Renee! That sounds like an awesome swap, I haven’t tried it so I can’t be 100% sure but it is a swap I’d totally do too. I wouldnt alter anything else either. I made this tonight – it was good. The veggies were great and the meat was phenomenal. However, it looks nothing like the pictures. There is not nice dark roasted top. It is congealed fat just like how it is when you boil it. So the flavor was great and I was overall but the photos are super misleading. I’m so sorry. Did you change any of the layering in the slow cooker? 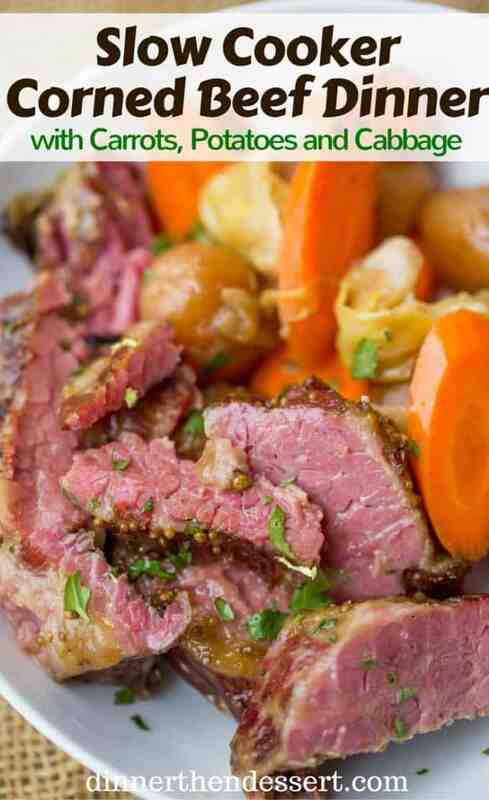 When the corned beef sits on top of the veggies and liquid, it allows it to get the crisp. I’m glad you still enjoyed the flavor! We went hiking in the mountains and I snuck this in the crockpot before we left. Came home to a warm and wonderful meal! SO tender! I only cooked it for 7 hours, as we like our veggies a bit firmer. Will make again! Isn’t coming home to a ready meal the best?! So glad you loved it! ooo I know what we’ll be making this weekend! Also, such a perfect one for St. patricks day! So excited to make this AND I am also so excited that the Catholic church has given a one day of deviation since St. Patrick’s Day falls on Friday 🙂 will come back and let you know it turned out. Thank you! Fantastic! Yes, definitely come back and let me know what you think! Everything about this recipe is wonderful and yummy! This is the perfect Sunday dinner! My family would go nuts for this! YUM! What a comforting dish for dinner! Our slow cooker has been getting a workout these days, and I cannot wait to give this corned beef a try. We’ve been using ours a lot too! Definitely put this into your rotation! Oh my gosh this looks wonderful! 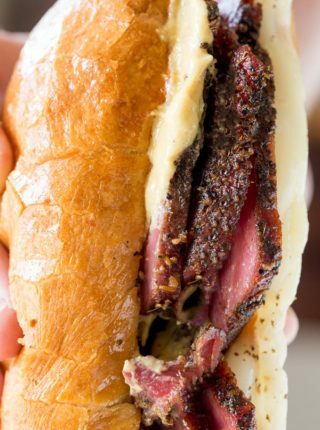 I adore corned beef! 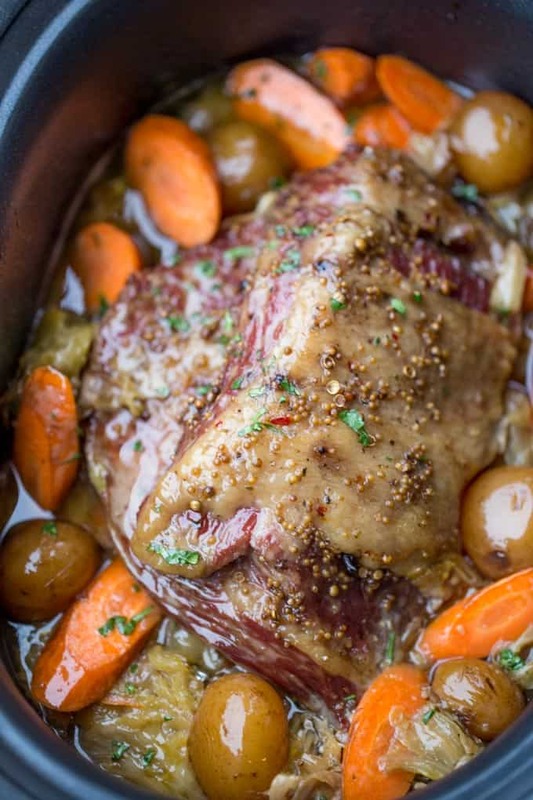 This is the perfect dinner for St Patrick’s Day! This looks gorgeous and I bet it tastes even better!